Almost 20 years ago the Whispir story began as the brainchild of two architects. Frustrated by patchy and poorly timed communications on construction sites they set about creating a small solution with huge impact. Over time the solution scaled and the first incarnation of Whispir was born. The feature set expanded quickly to meet the needs of our growing customer base and while the technology grew in power our user interface struggled to keep up. Instead of empowering our customers to create and iterate quickly our bulging interface became more like a maze. At the core of Whispir our ultimate value is still to empower communicators and with that in mind we’ve set about completely redesigning the Whispir experience. Based on your feedback, we’ve reduced the steps involved in completing simple actions like creating or sending a message and unearthed functions that make it easier for you to wow your audience like adding personalisation. 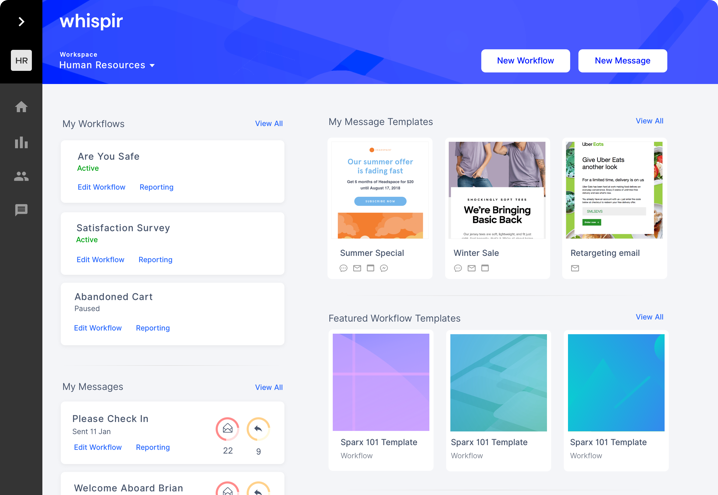 Your core experience will now centre around Messages, Contacts, Workflows and Reports with additional features being added to enhance your experience like in depth reporting at both campaign and account levels. We’re removing some of the feature bloat that’s lead to unnecessary complexities. In most cases your ability to complete certain actions won’t change just the process you use. Since the beginning, design and experience have been at the core of what we enable our customers to achieve. With so much focus on building a robust tech stack to empower this our interface was left in the shadows. 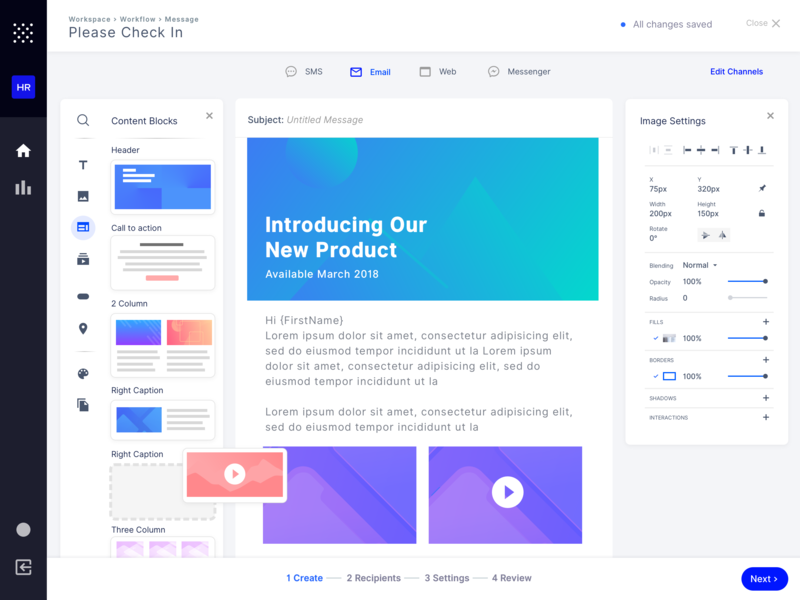 We don’t want the experience of our UI to overshadow the simplicity of creating engaging layered communications so we’re creating a modern functional space that helps instead of hinders and scales as we continue to grow. The mammoth task of redesigning our platform started last year. Taking stock of our feature set, uses and desired outcomes. This year you’ll be introduced to the new Whispir in several stages which aim to help cement the core foundations of the platform and then optimise your experience. Starting from today you can access phase one - Messages - the rebirth of both classic and rich message studio. In a few simple clicks you can compose your message, add recipients and send.